American visual artist Dan Dailey has simultaneously produced sculpture and functional art with an emphasis on lighting since 1970. Made primarily from glass and metal, every piece of work begins with a drawing. Dailey's drawings and the objects they inspire depict human character and the world we inhabit, with many familiar forms rendered iconic. Dailey's myriad series explore extraordinary concepts with a broad range of themes and styles. These attributes and his forty years of achievement and recognition have made Dan Dailey a prominent artist in the history of glass, and unique among American artists. Dailey was born in 1947 in Philadelphia, Pennsylvania, and received his Bachelor of Fine Arts degree from the Philadelphia College of Art. Dailey received his Master of Fine Arts degree from the Rhode Island School of Design. He is Professor Emeritus at Massachusetts College of Art in Boston, where he founded the Glass Department in 1973. He has taught at numerous schools including Massachusetts Institute of Technology, the Rhode Island School of Design, the Pilchuck Glass School and the Haystack Mountain School of Crafts, and he has given lectures and workshops throughout the United States, Europe and Japan. Dailey's emphasis on the individual development of his students' sculptural concepts has defined his approach to teaching. He now works in his New Hampshire studio with the help of a staff of assistants. 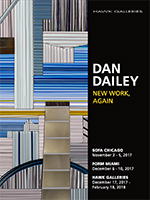 Since 1971, Dailey has participated in over 250 group, juried, and invitational exhibitions, and has had numerous one-person museum and gallery exhibits including a major retrospective at the Renwick Gallery of the Smithsonian Institution. He has completed more than 70 architectural commissions for corporate headquarters, hospitals, municipalities, a county courthouse, a performing arts center, and private residences. His work is represented in over 45 museum collections around the world.